It has begun. The first set of spoilers for the dragoniest dragon-filled set started spilling out of the Dragon Tempest yesterday, as we traveled back to the present, changed timeline in a plane of Tarkir ruled by dragons rather than khans. I have not been so excited for a new set before; it’s a whole set filled with dragons! It’s like a manifestation of my wildest dreams when I first started Magic as a 10-year old kid. Players like Dragons. Really like Dragons. No, really, really like Dragons. They are by far the most popular creature type we do. It’s the reason, for example, we made the first From the Vault box set with a dragon theme. Dragons has always been the domain of casuals and Timmies. Since Brian Kibler made top four of Pro Tour Chicago in 2000 with Rith, the Awakener and earned the venerable title of Dragonmaster, dragons have rarely graced the top tables, let alone tournament tables. We saw incessant caws, but no dragons. It all changed with Thundermaw Hellkite in 2012. And a badass dragon Thundermaw Hellkite was. After an initial lull during its first six months of existence in a meta highly saturated with Snapcaster Mage and Vapor Snag, Thundermaw became a Standard staple ran in playsets across numerous archetypes and its price peaked at $40 for a couple of months. Stormbreath Dragon came next. Being under Thundermaw ‘s shadow wasn’t easy, but Stormbreath Dragon’s initially cool reception thawed off as it proved to be the curve-topper of choice for decks with access to red. After all, a 4/4 hasty flier with protection from white and an option to transform into a gigantic 7/7 can’t be too bad. Stormbreath even saw occasional Modern play. 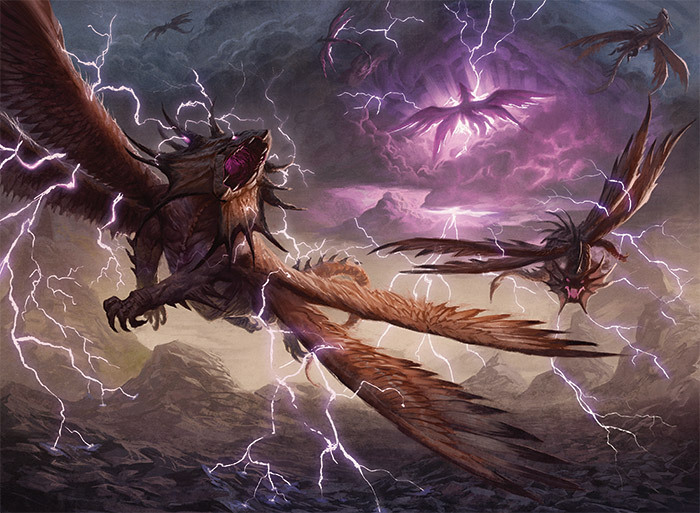 Will Dragons of Tarkir bring us more playable dragons? The design vision extolled in Mark Gottlieb’s article certainly suggested so. Since he stopped drifting, Silumgar began to put on a belly. Playable casting cost? Certainly. Playable stats? Let see, Dragonlord Silumgar dodges Elspeth, Sun’s Champion (again. Sorry Ms. Tirel), he dodges Stoke the Flames and wins a head on collision with Stormbreath Dragon and Wingmate Roc. Heck, Silumgar could even chump Siege Rhino and Tasigur, the Golden Fang (Vorthoses would know) all day long. Well, devour is probably a more suitable word here, seeing that Dragonlord Silumgar has deathtouch. Playability checked. Awesome enter the battlefield ability? Dragonlord Silumgar is Sower of Temptation on steroids. If you can’t kill em’ steal em’. Sleazy Silumgar allegedly has the charisma to persuade even the game-breaking Ugin, the Spirit Dragon and Elspeth, Sun’s Champion to his cause. Dragonlord Silumgar is the ideal card to break open those grindy midrange and control mirrors. He is not just an answer, but also a formidable threat by himself and I imagine plenty of games would be decided by a topdecked Dragonlord Silumgar stealing an opposing planeswalker. There is a good probability that Dragonlord Silumgar will see play in Standard. For a card chock full of value, he seems to be a perfect fit in Sultai Lord Gerard Fabiano’s Sultai Control that aims to outgrind opponents in value. Silumgar’s flexible enter-the-battlefield trigger and his stats that enable him to take down most popular standard fatties could warrant a couple of mainboard slots, but I don’t imagine seeing decks go for the full playset due to Silumgar’s high casting cost. But I could be wrong. Silumgar makes for a pretty good sideboard card as well, both in UB Control and Sultai variants. While I am confident about Dragonlord Silumgar’s Standard playability, I am doubtful about his place in Modern. Six casting cost is just much of an investment, especially with all the Path to Exile flying around. That is assuming that Gerard Fabiano does not break it. After all he just took down StarCityGame’s first Modern Open at Baltimore with Sultai. Can that man ever lose with Sultai? Dragonlord Silumgar is currently going for $9 on ChannelFireball, $10 on StarCityGames and closing at $11 – 13 on eBay. Which seem a bit on the cheap side to me. Dragons of Tarkir will be drafted for just eight weeks before Modern Masters 2015 hit the shelves on 22 May. For the purpose of calculation, let’s assume that Dragons of Tarkir-Fate Reforged draft would grind to a halt when Modern Masters 2015 is released. That means we would have opened eight weeks worth of Dragons of Tarkir and 17 weeks worth of Fate Reforged. As we would be drafting two Dragons of Tarkir with a single Fate Reforged booster, the number of Dragons of Tarkir booster opened would be about the same as the number of Fate Reforged boosters over their draft span. Another thing to note is that while the one in eight packs probability of opening a mythic is the same in both large and small sets due to the different size of print sheets used in large and small sets, the probability of opening a particular mythic is lower in a large set. Small sets contain ten mythics while large sets have fifteen. That means Dragonlord Silumgar, and other mythics in Dragons of Tarkir would be opened less than Fate Reforged mythics! Because we are opening two packs of Dragons for each pack of Fate Reforged, it is easy to mistakenly assume that the supply of a particular Dragons of Tarkir mythic would be higher than those in Fate Reforged. Watch out for the price of any playable Dragonlords. If Dragonlord Silumgar turns out to be Standard playable as predicted, a $15 tag would not be too far-fetched. Another reason $10 seems too cheap for Dragonlord Silumgar is the fact that he is an Elder Dragon creature type. There have only been five creatures in existence that are of the hallowed Elder Dragon creature type; there are more Gods than there are Elder Dragons. 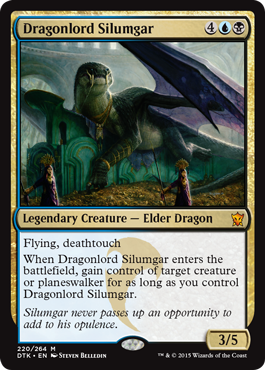 Dragonlord Silumgar being an Elder Dragon is a big flavor-win and I do imagine that fact alone would exude a higher than usual level of appeal to the casual crowd. And we all know never to underestimate casual demand as a price driver. On the other side of the casual demand coin, I struggle to picture Dragonlord Silumgar as a popular Commander. I can see him as on of the 99, but his ability does not feel abusable in Commander. Too bad Elder Dragon Highlander evolved into Commander years ago. Imagine the price of foil Dragonlord Silumgars if we were still playing according to the original Elder Dragon Highlander rules where you can only use Elder Dragons as your ‘commander’. Being an Elder Dragon does have one gameplay downside; my Cavern of Souls will no longer be a catchall in my dragon-centric Commander deck. I was wrong about that. Reader kraeuterbuddha pointed out Mark Rosewater’s answer on the topic: turns out that Elder Dragons are considered both ‘Elder’ and ‘Dragon’ when it comes to their creature type. Thanks kraeuterbuddha! FlyingWhenever a dragon you control becomes the target of a spell or ability your opponent controls, Thunderbreak Regent deals 3 damage to that player. 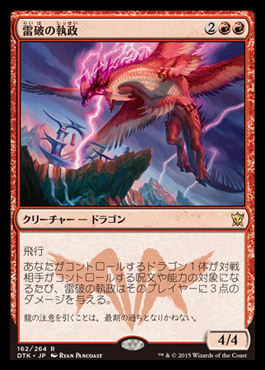 Let’s see, it’s a 4/4 flying body at playable casting cost that trades up with Stormbreath and Wingmate Roc (3/4 seems to be a lousy spot to be in a dragon-filled Tarkir) and trades on parity with Butcher of the Horde, which is harder to cast. Thunderbreak Regent also Lightning Bolts opponents who attempts to remove it out of creature combat or mass removal. It is a threat the deals damage, regardless whether it is answered or not, the kind of cards that puts your opponents in a catch-22 situation. I am no red mage, but Thunderbreak Regent sounds like a pretty good card in aggressive red decks as a follow up to Flamewake Phoenix, not to mention it triggers Flamewake’s ferocious too. Thunderbreak would be a superior choice over Ashcloud Phoenix for decks aiming to achieve the highest damage possible in the least number of turns. Thunderbreak Regent’s price trajectory would probably be similar to that of Flamewake Phoenix: starting at around$4-$5 before settling down at $2-$3. The next couple of weeks look to be a two week-long Christmas as Wizards drop a dragon or two down our chimney, when the clock strikes 0800 PST every day. Will the enemy-colored fetchlands finally see a reprint in Dragons of Tarkir? Certain passages from last week’s A Tarkir of Dragons hints at enemy-colored fetches in Dragons of Tarkir as it is an alternate timeline. Are we going to see enemy-colored fetches with a reversed version of the flavor texts in the ally-colored fetches as suggested by Redditor /u/daberu? The revelation that Dragons of Tarkir will feature ally-colored pairs certainly hurt the probability of seeing enemy-colored fetches in Dragons of Tarkir. The initial idea was to have enemy-colored clans, but it was changed to create a fresh draft experience; would there be a chance that the fetchlands remained? I also agree that from a financial perspective, there is little excuse for Wizards to include magic sales-bullet in a set that is pretty much going to fly off the shelves. Because dragons. I guess we would find out in a week or two if we would be cracking Scalding Tarns and Verdant Catacombs in Dragons of Tarkir Standard. Also, are we going to get a Narset planeswalker? And another Sarkhan! With the pervasiveness of Dragons in the set, is it too much to hope for a tiny, three casting cost legendary dragon? I bet there were plenty of other players besides me whose wildest (Magic) fantasy was a dragon set and that came true. Is it too wistful to wish for a legendary dragon that I can use as my leader in Tiny Leaders? Would the Dragonlords not need to groom their royal successors from a tender young age? In the mean time, we shall wait and see what the dragon tempest brings us daily. I for one welcome our Dragonlords. Nice necklace you’ve got there, Silumgar. It’s hard to believe but prior to this Khans block, we’ve never had allied colored dragon legends before. If you wanted to play a legendary dragon with allied colors like U/B, you were out of luck until now. You can now play Silumgar in either one of his two variants. Coupled with the fact that he’s lived over 1200 years, made bling out of a khan and topped all the blue and black dragons in this entire block- I’d say he’s earned the title of Elder. Hah! Well spotted about Silumgar’s necklace! I totally missed that really cool easter egg in the art. I guess we now know what happened to Tasigur in the alternate timeline! I have to say, that itself is badass enough to warrant Silumgar the title of Elder Dragon. Your can go on and name Dragon for your Cavern. Thanks kraeuterbuddha! Added the correction to the article. Until they make a card that destroys target Elder. They already have! Sort of. That might be a dumb remark, but isn’t it unlikely to see new enemy fetchlands in this set, considering that the dragon “cycle” (with only 1 dragon so far, I admit it) seems like it’s rather allied-fetch oriented? It was also said in an article that they no longer wanted to print half cycles of lands in standard (aka only enemy pairs or allied pairs) it’s always hard to tell what wizards is going to do, even after they have said they will or won’t do something, only the reserved list is sacred. Hah, the reserve list was not as sacred as many assumed, with the FTV: Relics fiasco. Yeah, Wizards can be quite ambiguous with the hints they drop regarding their intended design direction. I recall discussions about them not wanting fetches in Standard to reduce the amount of shuffling… so much for that. Wizards only stated that they don’t want to support the color-combinations with different AMOUNT of duals, not different duals. So every combination should always have the same amount of fixing duals. Currently the allied have fetches, the enemy-combinations have painlands. They never said they will only print full 10-cycles of duals. Yeah, the ally-colored Elder Dragons certainly tanked the chances of an enemy fetches reprint and yeah, Standard’s mana-fixing certainly looks good enough right now to support all those tricolor archetypes, another nail in the coffin of the enemy fetches argument. Now that we have more cards from Dragons spoiled, what do you think about short and long term prospects for Crucible of the Spirit Dragon from FRF? Short term, Crucible of the Spirit Dragon is probably headed for the bulk bin. Its ability seems too cute and durdly, even if a tier one dragon deck emerges (come on’ WotC, give us a tier one tribal dragon deck!). Long term, I think foil copies would be a good investment. However foils recently spiked – I’d imagine all the dragony spoilers have something to do with tha – and I don’t think $6 is a good buy in. Once the foil price dovetails to say, $3, it would be a very juicy target. Crucible of the Spirit Dragon is a card with a very low risk of reprint as well, being ingrained with the Tarkir storyline. Guess your fetch question got answered: Off to Zendikar we go! Such a shame that we didnt get Zendikar together with Karametra though, that interaction would have been SWEET!